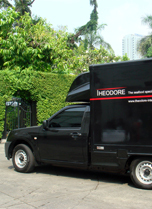 Theodoré International (Thailand) Co., Ltd. located in Bangkok, Thailand was founded in December 2004. We are an innovated, German family run business – two generations benefiting from each other. The company looks back on a long and successful history of experiences in Asia and in Europe. selling fresh premium seafood and are now well known as the seafood specialist. We can count the best hotels and restaurants in town and all over Thailand to our clients. Throughout the years we have expanded our seafood to non seafood products (Vegetable, Foie Gras,...). Theodoré provides the freshest premium products that are on today‘s markets. At the moment our products are mainly from France, Greece, USA and Thailand – day by day we are working on expanding our products. offer you more. We support you in all kind of different ways. We give you more information, more product insight or whatever your heart desires. be considerate and be involved – those principals help us to be more individual and to provide an excellent service towards our clients. At Theodoré we have one important rule, if we make a promise, we will make everything possible to keep our promise. Honesty, commitment and inspiration we expect from ourselves, from our partners and as well from our customers. partners and customer do the same under their countries regulations and laws. We at Theodoré, see and know that every customer is unique and has different requirements. Therefore we treat our clients as the individuals they are. As a small company, we are able to be more flexible and more individual, to meet all of your expectations, requirements and wishes. We at Theodoré work together with suppliers and producers, who are as flexible, loyal and honest as us. As well share the same perspective that each and every customers are unique. picking fruits in your own backyard. products on stock. All our fresh premium products are traceable back to their place of origin – the fishermen who caught the fish, the day boat, the farmers and producers. Our fresh premium products are transported in the required cooling conditions from their country of origin to their final destination. We at Theodoré ensure that our products which arrive – are the freshest. This way you can enjoy and store them longer. When the products arrive in Bangkok, we at Theodoré, do our own quality control before we deliver our fresh premium products to your doorstep. Our product price may vary depending on the market situation and the season. With most products like seafood also the size and weight +/- may vary. progress: reducing waste and to saving energy. contribute. We welcome all sorts of charity events. clearing. We all take part in preserving our environment and animals on our world. find in Bangkok or on our list, please contact us, we will source it for you. partners and us. Loyalty and honesty are the key points that make us who we are.